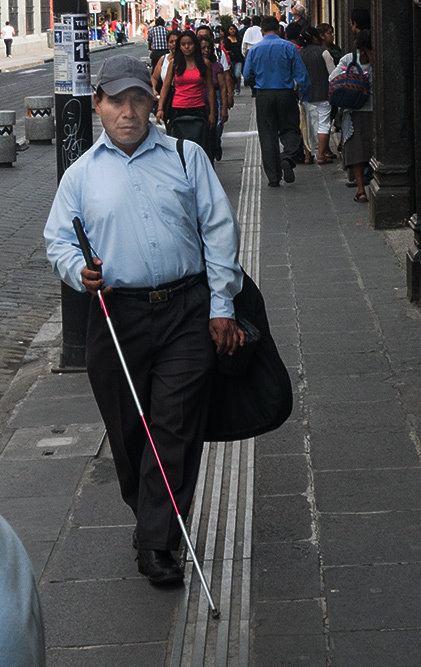 The benefits to you to make your website and PDF documents accessible to the blind and the visually impaired. We sometimes think of the disabled, particularly the blind and the visually impaired as "them", after all, we can see and they can't. We forget that we live in fragile packages, particularly as we grow older, and that a third of us will join the blind or visually impaired before we die. If we add to this our families and those close to us, we are very likely to see someone we know and love become one of "them", that is, to become blind or visually impaired. What we do for them is what we do for ourselves. Among our customers, the main reason cited to make websites and PDF documents accessible is our human need to just do the right thing. Of course a business looks at the cost of doing the right thing, but when they discover how low those costs are, their civic responsibility kicks in. Businesses are not mindless automatons but the face of the people running them, and when they think about it, they usually show that they care. The second reason we hear to meet accessibility standards is simple profit. Businesses know that their websites will sell more products or services if they can increase its visitation. They know how much an 8% visitation would cost in terms of advertising, promotion, etc. Making a website accessible could yield that same 8% visitation bump for less cost. Accessibility turns out to be an easy way to make more money. Businesses also wish their websites to place high on search engine lists like Google's. Search engines determine such list placement by reading the text on a web page much like the screen reader of a blind person. Like a blind person, Google can't see an image or click with a mouse. The same changes that make a website accessible to the blind often make it easier for Google's blind reader (aka crawler) to collect text that places the website higher on relevant lists. For the third and last reason, we have the government regulations compelling accessibility. Access2online can provide no legal advice, but 2017 and 2018 seem likely to witness enforcement increases, that is, reasons to consult your lawyer about what we present only as observations. The ADA regulations mandating wheelchair access were written before the arrival of websites, but their Title III covers public and commercial facilities and "Places of public accommodation". The Department of Justice has used that to negotiate settlements (H&R Block, Louisiana Tech, etc.) requiring penalties and websites to achieve an A or AA accessibility rating according to the WCAG 2.1 standard. In 1998, Congress amended the Rehabilitation Act of 1973 to include a Section 508 that requires federal agencies to make their electronic and information technology, including websites, accessible to people with disabilities. The final rule is effective March 21, 2017, with the compliance deadline on January 18, 2018, at which point all federal websites are to be compliant to WCAG 2.1. It does not seem to apply to websites of private industry, but if an agency receives a 508 complaint about accessibility from a website visitor and if the agency has no remedy, a 501 (federal employees) or 504 (general public) procedure is the default. Those procedures require a remedy or work-around but usually no penalties. Some state governments are adopting Section 508 into their own laws, for example California's Government Code 11135, requiring state agency websites to be as accessible as federal ones. The federal Office of Civil Rights approaches this differently. They don't address disability. They view an inaccessible website as denying a vulnerable group entry to a public place, much as they would get involved if a business denied entry to black people. Their current focus seems to be the websites of schools, libraries, and places where the visually impaired are denied education. Reflecting only our opinion, government enforcement seems to be just ramping up and taking a gentle, cooperative approach to start. Unlike for ADA rules that have been well known for many years, accessibility enforcers don't seem to open the conversation with penalties and threats, but with encouragement to do the right thing and to take the easy steps to remedy the problem. They seem to lead with carrots and whip out the stick only for the hard headed. We suggest the carrots. If you're reading this much after mid-2017, a lot of the above regarding regulations has probably grown obsolete. What will not have changed is the first and best reason to become accessible, to do the right thing.